The Gastornithidae are large, flightless, and graviportal birds, which occurred in the Paleocene to middle Eocene of Europe and the early Eocene of North America and Asia. The first fossils were reported from the late Paleocene of France by Hébert (1855) and were classified in the taxon Gastornis. Owing to the fragmentary nature of the then known specimens, early reconstructions of these European gastornithids were patently false (Martin 1992). This prevented recognition of their close similarity to the much better represented North American species, which were described as Diatryma, within the taxon Diatrymidae (Cope 1876; Matthew and Granger 1917). The Eocene European gastornithids were also assigned to Diatryma by earlier authors. Although Martin (1992) noted morphological differences between the latter taxon and Gastornis, synonymization of Gastornis and Diatryma was suggested by Buffetaut (1997) and formalized by Mllkovsky (2002). Buffetaut (2008) concurred that the slight morphological differences do not justify taxonomic separation of Diatryma and Gastornis. I also consider it advisable to unite the North American and European species in the taxon Gastornis, which has taxonomic priority. If Gastornis and Diatryma are kept separate, the former is likely to be paraphyletic (see below). The earliest record of the Gastornithidae is a coracoid from the Paleocene of Walbeck in Germany (Fig. 6.5; Mayr 2007a); Weigelt (1939) mentioned other gas-tornithid remains from this locality, which however seem to have been lost. The Walbeck coracoid is from a comparatively small species and may belong to Gastornis russelli Martin, 1992, which is the smallest named species. G. russelli was originally based on a tarsometatarsus and beak fragment from the late Paleocene of the Reims area in France, and has a more slender tarsometatarsus than other gastornithids; it is probably conspecific with Gastornis minor Lemoine, 1878 from the same locality, which was considered a nomen dubium by Martin (1992). the Paleocene of France and "G. klaasseni" Newton, 1886 from the early Eocene of England. Mlikovsky (2002) regarded G. ("Diatryma") geiselensis (Fischer, 1978) from the middle Eocene of Messel and the Geisel Valley (Fig. 6.5; Fischer 1962, 1978; Peters 1988a, 1991) as a junior synonym of G. sarasini (Schaub, 1929) from the early Eocene (MP 10; Mlikovsky 2002) of France (Fig. 6.5; Schaub 1929). Still, however, a thorough revision of these species is needed, in which the type specimens are directly compared with each other. The North American Gastornithidae were revised by Andors (1992), who recognized two species, G. ("Diatryma") gigantea (Cope, 1876) and G. ("D.") regens (Marsh, 1894), which differ in toe proportions. Both occur in the Rocky Mountain region of western North America and are restricted to the early Eocene (mainly Wasatch and Willwood Formations). Zhongyuanus xichuanensis Hou, 1980 from the early Eocene of China is based on the distal end of a tibiotarsus (Hou 1980, 2003). According to Andors (1992), this species is morphologically distinct from the European and North American Gastornithidae. The degree and significance of this difference is, however, still in need of critical revision. 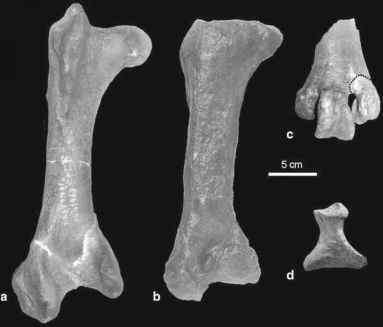 Buffetaut (2004) commented on footprints of giant, tridactyl groundbirds from the late Eocene of France, which were assigned to Gastornis, but whose identification conflicts with the fact that the latter has no late Eocene skeletal record. 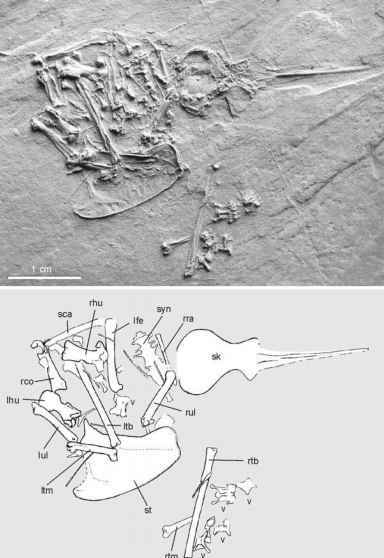 Patterson and Lockley (2004) described a track of a large tridactyl bird from the middle Eocene (45 Ma) of Washington as Ornithoformipes controversus and assigned it to a Gastornis-like bird. Again these footprints are about five million years younger than the known North American skeletal remains of the Gastornithidae, and some controversy surrounds their authenticity (Patterson and Lockley 2004). If they indeed stem from a species of Gastornis, they would establish the presence of hooflike ungual phalanges in this taxon. The discovery of gastornithid remains in the early Eocene of southern France supports earlier hypotheses (Dughi and Sirugue 1959; Fabre-Taxy and Touraine 1960) that large eggs from contemporaneous deposits of Provence belong to the Gastornithidae (Buffetaut 2008). According to Fabre-Taxy and Touraine (1960) some of these eggs measure 24 cm x 15 cm and would thus be of a size to be expected for gastornithids; Dughi and Sirugue (1959) even estimated the size of the largest eggs at 40 cm x 20 cm (see Buffetaut 2008). Putative feathers of Gastornis ("Diatryma") were described by Cockerell (1923) from the early Eocene of Colorado, but identification of these hair-like filaments was disputed by Wetmore (1930). Gastornithids are characterized by a huge, bilaterally compressed beak, which has a convex culmen and lacks a hooked tip. The cranium exhibits upper temporal fenestrae. The wings are greatly reduced and the sternum has no keel. At least in the larger species scapula and coracoid are fused to form a scapulocoracoid; such fusion is absent in the Walbeck coracoid (Fig. 6.5), which in contrast to that of other gastornithids also lacks a foramen for the supracoracoideus nerve. The palate is of neognathous structure, and, in contrast to those of palaeognathous birds, the ilioischi-adic foramina of the pelvis are closed. The ribs lack ossified uncinate processes. The legs are very robust, with a short tarsometatarsus and a short hallux. The largest species were nearly 2 m tall and had an estimated weight of about 175 kg (Andors 1992). Andors (1992) revised the phylogenetic affinities of gastornithids and concluded that they are the sister group of the Anseriformes. Derived characteristics shared with other Galloanseres include the presence of retroarticular processes on the caudal ends of the mandible, sessile basipterygoid processes, and features of the quadrate. The evolutionary origins of the Gastornithidae are, however, unknown. Because of its smaller size and more slender tarsometatarsus, G. russelli may be the sister taxon of the other gastornithids. If true, this would argue for a European origin of the group, which is also in concordance with the temporal occurrence of the known species (Andors 1992; Buffetaut 1997). Current evidence suggests that gastornithids dispersed into North America in the early Eocene (Andors 1992). Against the received view of diatrymids [=gastornithids] as cursorial predators..., it can be argued that the weakly developed rostral hook, reduced flexor tubercles on the ungual phalanges of the toes, and shortened tarsus seriously impeded this mode of feeding and may have precluded it altogether. The folivore hypothesis.best fits the known morphology of the diatrymid jaw apparatus, and it agrees also with the large size, flightlessness, neck and pelvic limb proportions, vegetated palaeoenvironment, and presumed anseriform affinities of these singular birds. Suggestions that Diatryma [=Gastornis] was an herbivore seem improbable in that they require the postulation of excessively high safety factors in the construction of the skull. The traditional hypothesis of Diatryma as a carnivorous bird accords as well or better with the data at hand. Carnivory raises the probability of "accidental" encounter with bones, thus explaining the high safety factors. A folivorous diet may, however, also include very hard food items, such as seeds and twigs, and I consider the evidence presented by Andors to be the more compelling. Folivory in gastornithids is further supported by the fact that a herbivorous diet has been conclusively shown for the Dromornithidae, which are discussed in the next section, and some of whose representatives closely resemble gastornithids in bill shape.